Discover some of the best anti-aging skin care formulas with SkinCeuticals antioxidant products. From powerful vitamin C antioxidant serums to sunscreens to versatile cleansers and nourishing moisturizers, SkinCeuticals skin care products are designed to improve skin’s health and prevent future skin conditions. SkinCeuticals skin care is based on the principles of prevention, protection and correction and every skin care product is backed by proven science to help maintain and improve skin health. Address fine lines and wrinkles, sun damage, dry skin and more with this exclusive line of products that are only available through dermatologists, plastic surgeons, spas and other skin care professionals. SkinCeuticals makes one simple promise: to provide advanced skin care that is backed by science. 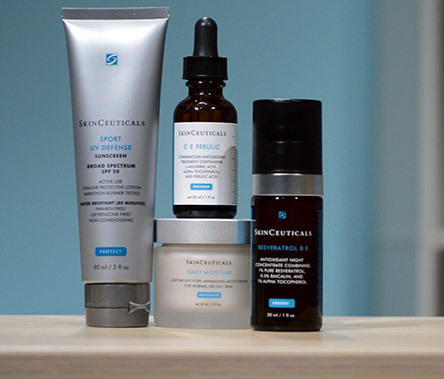 SkinCeuticals became the standard for effective antioxidant formulation through decades of skin cancer research that led to breakthroughs in the benefits of antioxidants for addressing sun damage, fine lines and many other signs of aging. SkinCeuticals’ potent formulas like CE Ferulic and Phloretin CF are highly concentrated with proven antioxidant-based actives, designed to penetrate deeply into skin. With SkinCeuticals, you’ll find a wide variety of anti-aging products, including bestsellers like C E Ferulic, Triple Lipid Restore 2:4:2 Moisturizer and Discoloration Defense. Whether you’re looking to minimize dark spots, treat adult acne or smooth fine lines, you’ll find a rejuvenating treatment that’s perfect for you. At LovelySkin, we only sell products that are 100% authorized and certified by the brands we carry, including SkinCeuticals skin care. For more information about these and other SkinCeuticals products, please contact our customer care departmentor call 402-697-1100. 1. What are SkinCeuticals’ best sellers? SkinCeuticals offers a diverse line of skin care products for every skin type. Our current SkinCeuticals best sellers and staff favorites include CE Ferulic a revolutionary vitamin C antioxidant serum, Triple Lipid Restore 2:4:2 Moisturizer to restore skin’s moisturizer barrier and Physical Fusion UV Defense Tinted Sunscreen SPF 50 to provide 100% physical sunscreen protection. Read SkinCeuticals Reviews for customer favorites! 2. Which SkinCeuticals serum is best for my skin? SkinCeuticals antioxidant-based serums can improve hyperpigmentation, acne scars, sun damage, uneven skin tone, fine lines and wrinkles. SkinCeuticals serums are formulated with skin type in mind, so whether it’s CE Ferulic for drier skin, Phloretin CF for oily skin or Resveratrol B E for aging skin, there is something for everyone. In this video, we discuss the best SkinCeuticals serums to rejuvenate skin and provide superior free radical protection. 3. Does SkinCeuticals only offer anti-aging skin care products? No. SkinCeuticals offers a variety of products beyond antioxidant anti-aging serums and treatments. You can find a diverse line up of cleansers, masks, scrubs, moisturizers and body treatments that rejuvenate skin of all types, including sensitive, acne-prone and oily skin. SkinCeuticals also offers a variety of some of the best sunscreens on the market to protect and defend skin against harmful UV rays, free radical damage and atmospheric aging. 4. What is the best SkinCeuticals vitamin C? The best SkinCeuticals vitamin C product and coincidentally their most popular product is CE Ferulic. This revolutionary serum contains 15% vitamin C, 1% vitamin E and .5% ferulic acid to neutralize and defend skin against free radicals while brightening the complexion and increasing firmness. SkinCeuticals CE Ferulic prevents oxidative stress on the skin and protects against atmospheric aging. 5. How do I apply CE Ferulic? SkinCeuticals CE Cerulic should be applied in the morning right after cleansing and toning if desired. Apply four to five drops on your face, neck and chest and gently press the serum into your skin with your fingertips. For more tips, check out this video on how to layer SkinCeuticals products. Unlike typical hyaluronic acid serum, this one doesn't make skin stiff or pill up. Good consistency and quite effective in plumping up my face.